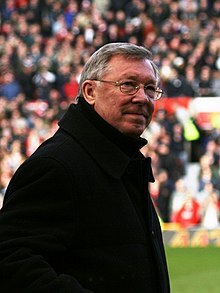 Sir Alexander Chapman "Alex" Ferguson, CBE (born 31 December 1941) is an umwhile Scots fitbaw manager an player who managed Manchester United frae 1986 tae 2013. ↑ "Alex Ferguson". London Hearts Supporters' Club. Retrieved 5 December 2011. ↑ Bell, Stephen; Zlotkowski, Andre (6 June 2008). "Scotland XI Tour of Asia and Oceania 1967". Rec.Sport.Soccer Statistics Foundation. Retrieved 5 March 2011. This page wis last eeditit on 26 Mairch 2018, at 06:01.